A stunning amethyst cradled in 9ct white gold and diamonds. A dazzling necklace for any occasion. 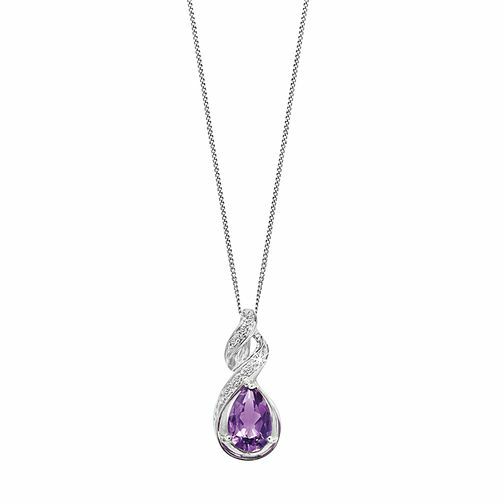 9ct white gold amethyst and diamond necklace is rated 4.4 out of 5 by 10. Rated 5 out of 5 by Anonymous from Excellent quality I had bought the ring for my daughter when she broke up with her boyfriend. I bought the necklace for her birthday and she loves it. It was the first time I have used Ernest Jones and would recommend them to anyone. They are so customer focus that I cannot fault them. Guess what my daughter is getting for Christmas, yes the earrings to match. Rated 2 out of 5 by Anonymous from Let down Certainly not as bright as the picture would suggest, although the Amethyst stone is a good colour. . Wife is mid forties and was bought as a gift and will be returning. She has said the necklace is too thin/flimsy and design is quite old fashioned.